"Bailey Ruth maybe dead but that doesn't stop her from solving crimes"
Bailey Ruth works for Heaven's Department of Good Intentions and has been sent to Adelaide, Oklahoma in search of trouble. When Bailey Ruth discovers she is helping out the ghost of her boss's former love she does what she can to help. Bailey loves coming back and helping people out. She is real good at solving crimes and keeping the innocent out of jail. What she believes is a simple case of vandalism, turns out to be a multiple murder and things are quickly getting out of hand. Bailey Ruth must solve the crime fast before an innocent girl goes to jail. GHOST WANTED is a cozy mystery that has a ghost helping to solve a murder and save the day. Fun read with interesting characters from the ghost solving the crime to the local police. The police chief is only a small part of the story but he is a real good guy. 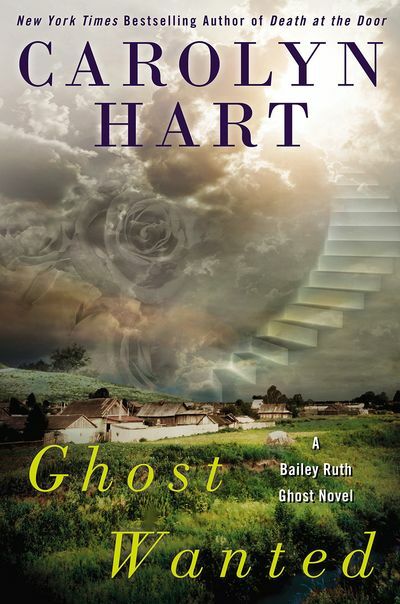 Carolyn Hart has created a group of characters you can't help but love in GHOST WANTED. Ghostly gumshoe Bailey Ruth Raeburn of Heaven�s Department of Good Intentions is checking out a troubling disturbance in Adelaide, Oklahoma. But what seems at first like simple vandalism won�t be an open-and-shut case� Bailey Ruth�s supervisor, Wiggins, is worried about a dear old friend. The ghost of elegant Lorraine Marlow haunts Adelaide�s college library. Known as the Lady of the Roses, she plays matchmaker, using the fragrant flowers to pair up students. But someone�s making mischief after hours, leaving roses strewn about the library, destroying a gargoyle, and stealing a valuable book. Concerned with Lorraine�s reputation among the living, Wiggins dispatches the irrepressible redhead Bailey Ruth to investigate. Soon after her arrival, trouble begins to stack up. A campus security guard is shot by an intruder, and Bailey Ruth uncovers a catalog of evidence blaming a student for the crimes. As a ghost, she may not be all there, but even Bailey Ruth can decipher that something isn�t adding up.